Graduate positions: where do you start? 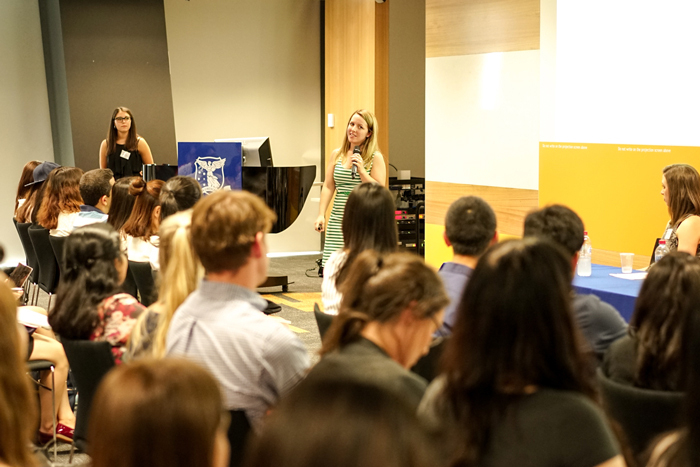 The Melbourne Business School Student Association (MBSSA) hosted a sell-out event with a panel of Human Resources experts who shared their top tips and what to expect when applying for graduate positions. Melbourne Business School (MBS) students were invited to a professional development event last week, hosted by the Melbourne Business School Student Association (MBSSA). 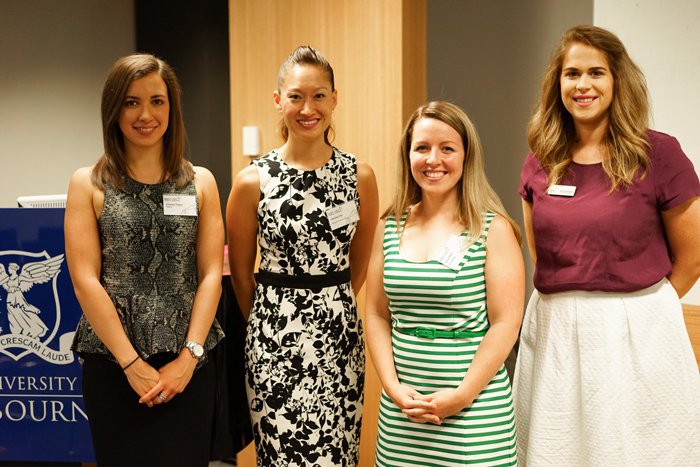 The evening’s panellists and HR professionals, Selina Reid (BP), Maddi Roulston (EY), Caroline Chu (NAB) and Vanessa Tieppo (Telstra) explained the four areas of recruitment from an insider’s perspective. Here are some of the top tips that were shared from the evening. Reid assured students that any degree is valuable. Your resume should clearly present who you are, and powerful language can make a huge difference in convincing the recruiter on whether or not you stand out. Reid recommended thinking about how you phrase your experience – for example, ‘dealing with customers’ versus ‘promoting a fantastic customer experience’. Students often have little to no work experience, so it is important to include a personal statement that explains “the course of your life” and why you are applying, and interning is therefore also a bonus. In fact, at BP, interns are often hired into graduate roles. “We have had the chance to get to know them extensively, and ultimately, this leads to cost-saving benefits when considering hiring and on-boarding processes,” Reid explained. She also recommended taking the time to do research into the role and company to find out what the most desirable skills are for a candidate to possess. Because graduates have very little work experience, it is important to decipher what transferrable skills you have. “Even if you’ve only ever worked in a fast food chain for work experience, that counts as possessing customer service skills and could show that you are service-oriented,” explained Roulston. Selina Reid from BP, who shared that she had seen some interesting skills listed on resumes including 'Indian head massage' - and probably best left out as it is not relevant to most business-related graduate positions. She stressed that a good interview is conversational and one that is guided by the interviewer leading the direction, and the candidate speaking for roughly 80% of the time. As the first face-to-face opportunity between you and the organisation, presenting professionally is important. Tieppo shared that this was the point where you would be observed and judged on a number of behaviours, mainly how well you work in a team, and your leadership skills. She highlighted that on top of showing how you problem-solve and work in a team, you should also be mindful of not getting distracted (turn off that phone!) and paying attention to the instructions given. Reid added to this, saying, “It’s not always about your grades, too. We weight both IQ and EQ, and award extra points for different things in both areas!” She recommended highlighting participation in activities that develop your skills outside the classroom. Nicola Rossdale, current Master of Management (Marketing) student, said the event surpassed her expectations. “I was quite surprised how useful and relevant the information was. I now feel more confident applying for jobs as I have a better understanding of what recruiters are looking for," she said with a smile. "A small but insightful tip I had not thought about, but discovered at the HR event, was that usually online applications are checked first- so if they don’t like your application they won’t read your resume. Include everything!" Students at MBS have the opportunity to attend a wide range of professional development programs organised by both MBSSA (read about the current MBSSA President’s vision for 2017) and the Faculty of Business and Economics’ Student Employability and Enrichment team (see: TRAPT Melbourne visits The Spot). To support their ongoing learning in extracurricular activities, students are encouraged to participate regularly. L-R: Vanessa Tieppo, Caroline Chu, Selina Reid and Maddi Roulston.